This plugin provides a database to store, modify and call text identified by so called messageId's and a languageCode to specifiy which language the message is written in! The plugin is written in a way so u can use it for BungeeCord or Spigot above 1.8.X either way its mostly based on runtime independent code. The only thing thats based on the runtime is the command and the listener to register/update the users. The plugin uses a concept where it caches the database on every startup, so the traffic between server and database can be at minimum. Changes still will be updated to the database but the normal request of a message or a users language is the cached data! The commands are disabled on spigot if u set the value of `bungeecord` to true. If you us this plugin not on a BungeeCord Network change it to false to enable the command and the listeners! The API comes with a full javadoc to help understand what a method does also u can take a look at the github Page. There you'll find a few examples what u can do with the API. If you have found a Bug or other Problems please report them to me via PM or directly through the discussion area of this resource. Please do not write Error or Bugs as a Review! They will be ignored! 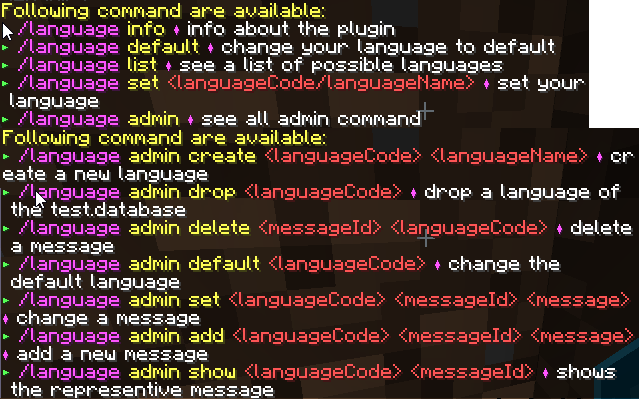 I give it three stars because creating plugins is difficult and a lot of dedication time, I would give it 5 stars if I knew how to translate for example all server messages including compass like Hypixel.